Wireless is now the de facto method of joining networks, and as the number of mobile devices requiring access has skyrocketed, IT admins must make smart choices about coverage and capacity. Essentially, they must have the options available to select the right hardware for a given scenario — a one-size-fits-all omnidirectional coverage solution for indoor deployments is no longer tenable. The coverage needs of a high-density indoor stadium deployment servicing ten thousand guests differ drastically from those of a basic wireless network for a small business employing fifteen people. And no matter which scenario a wireless network falls into, having more visibility and insight into issues relating to client association, latency, and capacity are always welcome. 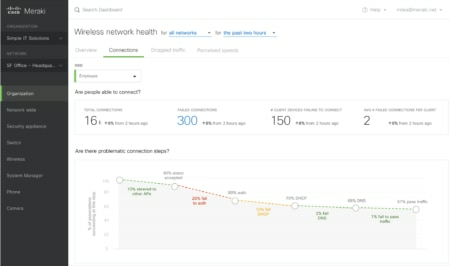 With this in mind, we are thrilled to announce a new tool in the Meraki dashboard, Wireless Health, as well as a slew of new wireless APs, antennas and accessories that will round out our product portfolio and deliver more flexibility for our customers to select the type of coverage they need for a given deployment. We will be deep-diving into these new products and features in follow-up blog posts over the coming days. Wireless Health helps IT teams verify that wireless users are able to access the network as expected and that they have a fast, reliable wireless experience. By simplifying root cause analysis for all connected wireless clients in a single dashboard, IT teams can proactively manage and answer complex questions without having to manually dig through the entire network stack. 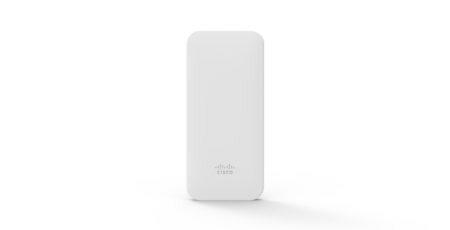 Wireless Health will be available for all Meraki MR models soon. Smart wireless also means having the right hardware for the job. 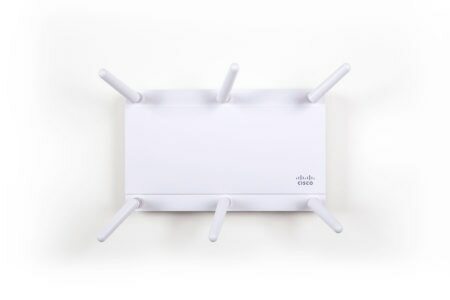 In order to provide more options for customers who have specific indoor coverage needs beyond omnidirectional, we’re adding two new, 802.11ac Wave 2 indoor access points that support external antennas to the Meraki MR portfolio: the MR53E and MR42E. The MR53E (left) and the MR42E (right) wireless access points. To support these APs, we’ve designed six new antenna families, most of which support smart technology allowing the MR53Es and MR42Es to automatically detect and classify the antennas. We also will be rolling out a new dashboard feature in the coming weeks that enables IT admins to create custom RF profiles (or use pre-built templates) to fine-tune coverage in challenging or high-density scenarios, and for advanced customers to customize RX-SOP (a technology that helps mitigate co-channel interference) settings across multiple APs. Some installations require basic wireless coverage for a small number of devices, and have no plans to leverage location-aware services that require mobile app integrations and Bluetooth. 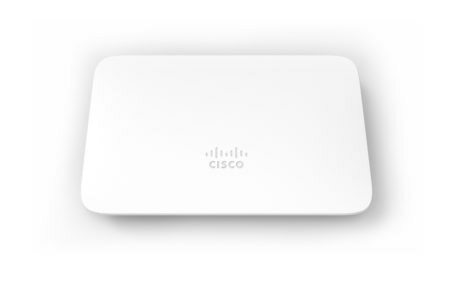 For these customers, we’re excited to announce two new access points, the MR70 and MR20. The MR70 (left) and the MR20 (right) wireless access points. Both of these APs are designed for basic, very low-density deployments, and have neither the dedicated third scanning/security radio nor the dedicated Bluetooth Low Energy (BLE) radio found in our other APs. They both support Meraki’s integrated wireless Location Analytics, however. The MR70 is designed for those looking to rapidly deploy basic, ruggedized, IP67-rated wireless outdoors. The MR20 is an indoor model, also designed for very low-density wireless coverage. We believe these new features and access points will allow IT administrators to deploy smarter wireless solutions for their given environments. All of these new APs and antennas will be orderable and shippable beginning February 13th, 2018. RF Profiles capability will be available by end of February. Wireless Health should be available starting in the second calendar quarter. 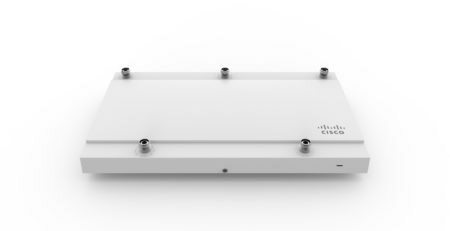 For more information, please check out our wireless webinars, or visit us at meraki.cisco.com. We’re always keen to hear your thoughts and feedback, so please either drop us a line on social media or leave a comment in our Meraki Community.